© ISTOCK.COM/TECHNOTR; BADGE COURTESY OF SCIENCE EXCHANGEStephan Lange had his figures all ready for the manuscript when he decided to double-check his antibody. The University of California, San Diego, cell biologist stained tissue samples from a mouse missing the G-protein–coupled receptor he was interested in, figuring the antibody wouldn’t give him a signal. But it did. He cut the figure based on that antibody from his manuscript. The rest of the story stood, though it was a bit less interesting for the loss, Lange said. Lange is far from alone in his disappointment. Antibodies are some of the most commonly used and commonly flawed reagents in biology labs, and pricey, too. Lange points out that the typical commercial antibody—at, say, $200–500 for 100 micrograms, or $2,000–5,000 per gram—costs more than gold ($35.29 per gram as of Jan 12, 2016). But scientists say there’s a lot of fool’s gold in them thar antibody catalogs. In one study of more than 5,000 commercial antibodies, only half worked in both Western blotting and immunohistochemistry (Mol Cell Proteomics, 7:2019-27, 2008). Some researchers believe faulty antibodies bear the brunt of the blame for the fact that many scientific studies are irreproducible (Nature, 518:27-29, 2015; Nature, 483:531-33, 2012). Antibodies are some of the most commonly used and commonly flawed reagents in biology labs, and pricey, too. And more and more scientists are now advocating for higher antibody standards. 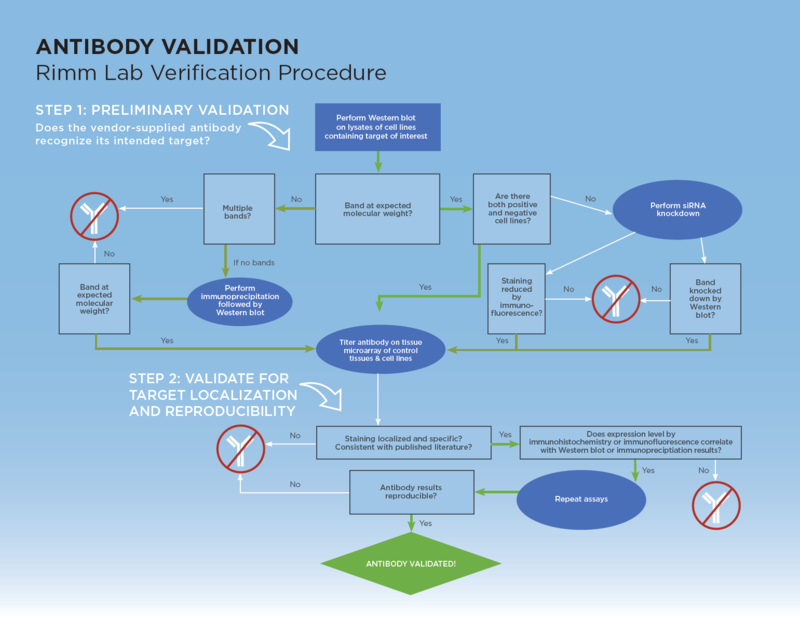 In one effort, the Global Biological Standards Institute in Washington, DC, and collaborators aim to develop antibody-validation guidelines for researchers and manufacturers to apply to their reagents. But guidelines alone won’t be enough, unless someone insists those standards are followed, points out the institute’s president, Leonard Freedman. Journals might decline to publish papers with poorly validated antibodies, he suggests, or grant agencies could refuse to pay for suspect reagents. Starting this year, in fact, the National Institutes of Health will require that grant applicants detail efforts to validate the antibodies they use, though this will not affect scores, Freedman said. COURTESY OF SCIENCE EXCHANGESome companies that manufacture or sell antibodies are already combing through their catalogs, performing more-stringent validation tests to strengthen the credibility of their reagents. For example, the clearinghouse called antibodies-online—with an inventory of more than a million primary antibodies and other reagents from 120 suppliers—has partnered with the independent validator Science Exchange so those suppliers can request that a disinterested lab test their products. Antibodies that pass receive a special “Independently Validated” badge in the clearinghouse’s catalog. The processes of developing standards and testing catalogs takes time, however, so for now the rule of the day is “Buyer beware.” But even in the long run, the ultimate responsibility for antibody validation will lie with the user. “Scientists need to protect themselves by testing every antibody they use,” says Andrew Bradbury, a molecular biologist at Los Alamos National Laboratory in New Mexico. Read on for tips on how to find the most sensitive, specific, and reproducible antibodies for your research. Polyclonal antibodies comprise all immunoglobulins generated by B cells in response to an antigen. To produce polyclonal antibodies, the first step is to inject an animal, often a rabbit, with the target protein. Serum collected from that animal can contain several antibodies which will bind to sites on the target protein, albeit with different affinities, plus a slew of other antibodies unrelated to that antigen. Often the presence of multiple antibodies directed at the same target boosts the chance of detecting a signal in your desired application. To get a more consistent product, antibody makers culture individual B cells, fusing them with immortal cells to create hybridoma cell lines that should each make a monoclonal antibody directed at a specific target site. Then they identify those cultures that produce the desired antibodies, and use those cell lines to produce larger quantities of the monoclonals. However, even in a monoclonal culture, the cells can stop making antibodies, or the antibody genes can mutate. Thus, Bradbury and others believe the best option is to go a step further, defining monoclonal antibodies not by the cell line that makes them, but by the DNA sequence that encodes them. For these so-called recombinant antibodies, the genes for the desired antibody would be cloned from B cells, sequenced, and—if Bradbury had his druthers—that sequence made publicly available. No matter what happens to the cell line, anyone could use that DNA or sequence to make an identical antibody. Scientists could even tweak the sequences to make all-new antibodies without ever injecting an animal. for antibody validation will always lie with the user. It’s also important to consider the antigen used to make an antibody. A synthetic peptide may generate an antibody that works great on a Western blot, where the proteins are denatured, but misses the fully folded version in intact cells or tissues. Conversely, an antibody generated to target an intact protein might not detect a denatured version. Your first stop should be the scientific literature. Check what antibodies other researchers are using to track your target. Manufacturers and websites such as antibodypedia.com and CiteAb.com list references for antibodies. Dig into those papers, advises Anthony Couvillon, scientific marketing project manager and former antibody development scientist at Cell Signaling Technology in Danvers, Massachusetts. Were the articles published in good journals? Did the authors show full Western blots, so you can see that there weren’t other nonspecific bands? Did they do the proper controls? Don’t assume the most-published antibody is the best one out there, says Fridtjof Lund-Johansen, a proteomics scientist at Oslo University Hospital in Norway. Often the antibody everyone uses is just the first one that came out. One problem with antibody markets is that the manufacturers aren’t always the sellers, says Jason Li, founder and CEO of Proteintech in Chicago, whose company only sells antibodies produced in-house. Antibody clearinghouses offer such huge catalogs that they have little motivation to ensure every product is a winner, Li laments. To make good purchases, carefully review the data sheet provided by the seller. Do they show convincing data that the antibody works for your desired application? If you’re looking for an antibody specific for a modified protein—such as an acetylated version—check to see if the manufacturer did a peptide array, testing the antibody against several different modifications to that protein. Couvillon suggests checking all the products a vendor offers for the same target, making sure the promises are similar. If the molecular weight or cellular location varies between antibodies that allegedly bind the same antigen, be suspicious. Pick a few antibodies to try—but he warns that if you find identical data sheets at different sellers, most likely it’s the same antibody being sold under a different banner. One thing he looks for is sensitivity, and a high signal-to-noise ratio. On a Western blot, the antibody should label a nice clear band at the target’s molecular weight, and not much else. With immunohistochemistry, it should label the tissues where that protein resides, and not others. Using immunofluorescence, it should identify the part of the cell where that protein is known to hang out. Cells or tissues that express varying amounts of the target protein should yield results that reflect those levels. If you have access to more than one antibody, look for those that give matching results. Additionally, the antibody should find little to bind in a negative control. The gold standard is to apply the antibody to cells or tissues lacking the target protein. In 2014, Proteintech began to validate their antibodies using RNA interference (RNAi) to knock down genes in cell lines, making those its negative controls. By last fall, the company had tested nearly 800 antibodies of the 12,000-plus in its catalog. In December, Proteintech announced it will step up its rate, with a goal of RNAi validation of their complete antibody line as quickly as possible. Abcam in Cambridge, U.K., uses knockout cell lines created by CRISPR gene editing to validate its antibodies. Having started in late 2015, Abcam is working through its catalog of just under 100,000 antibodies at a planned rate of 300–500 per year, said CEO Alan Hirzel, adding that the company has already stopped selling a handful that failed testing. Found an antibody you like? Make sure it’s reproducible, on a different day or by a different scientist. And check again, every time you order. Lot-to-lot variation is how Rimm got in trouble. He developed his clinical test with a panel of antibodies, but when he ordered the same products a few years later, two of them gave him different results. This is particularly an issue with polyclonals: different bleeds or different rabbits yield different antibody cocktails. This can be controlled somewhat by strict control of the animals, Li says, such as using genetically similar rabbits of the same gender that are housed under the same conditions. Monoclonals should be one antibody, but even they can’t guarantee identical results from lot to lot. Part of the reason is that not all so-called monoclonal cultures result from a single antibody-producing blood cell, says Bradbury. Some are really oligoclonals, originating from multiple antibody-producing cells, and the dominant antibody can vary. Recombinant antibodies offer an additional layer of protection against lot variation, but they aren’t perfect, either. For example, different host cell lines might make different posttranslational modifications to the recombinant antibodies, changing their affinities. Even the pH or oxygen level in the media can affect the final product. Plus, no matter what class of antibody you order, it’s always possible the tube thawed at some point in transit, damaging the protein. If you don’t get good results on the first try, don’t give up. Call the supplier’s tech support. For all you know, you got a bad lot, and the company will provide a new tube. Or you might just need some help with the protocol. For example, certain antibodies are only compatible with specific methods for blocking a blot or for fixing tissues. When you find a good antibody and publish your results, include the details, suggests Nicole Perfito of Science Exchange. By providing the manufacturer, product, and lot numbers, you’ll make it easier for others to reproduce your findings. By some measures, an antibody’s performance comes down to a matter of opinion—does the band on a Western or stain on a tissue look strong enough, clean enough to you? A couple of scientists are working on methods that give antibodies a quantitative score or allow side-by-side comparisons. Biochemist Aled Edwards of the University of Toronto and colleagues generated 1,124 synthetic antibodies, immuno-precipitated target antigens from a cell lysate, then performed mass spectrometry on the precipitates to quantify exactly what the antibodies had pulled down. Only 354 antibodies pulled down mostly their target protein, or its known partners. (Nat Methods, 12:725-31, 2015). At Oslo University Hospital in Norway, Fridtjof Lund-Johansen has developed a method that he compares to running hundreds of simultaneous immunoprecipitations. The researchers fractionate cell lysates by subcellular location and size and biotinylate the lysate’s proteins for a labeling step later on. By mixing the biotinylated proteins with a pool of various antibodies, each type attached to a different color of bead, the researchers can immunoprecipitate the proteins and use fluorescent streptavidin, which binds biotin, to label them. Running the beads through a flow cytometer, they identify each antibody by the bead’s color and the amount of protein bound by the streptavidin signal (Mol Cell Proteomics, 8:245-57, 2009). Comparing the results to mass spectrometry data from each fraction tells the researchers if their antibodies pulled something down from the fraction with the target protein or an undesirable antigen of a different size or cellular location. Lund-Johansen is also working on a method that will use denatured proteins, comparable to running numerous Westerns in parallel. Both methods evaluate antibodies for capabilities in immunoprecipitation, which may not indicate success in other applications. However, it could at least help narrow down a panel of antibodies to a few top candidates, Edwards suggests. Many labs won’t have mass-spec capabilities, and being able to compare antibodies with either method requires precise protocols so that each antibody gets the same treatment. Edwards envisions a core facility that would compare antibodies under strict quality control. Lund-Johansen, who invented his method to identify the best antibodies for his proteomics work, hopes to partner with small antibody manufacturers to compare their products en masse.